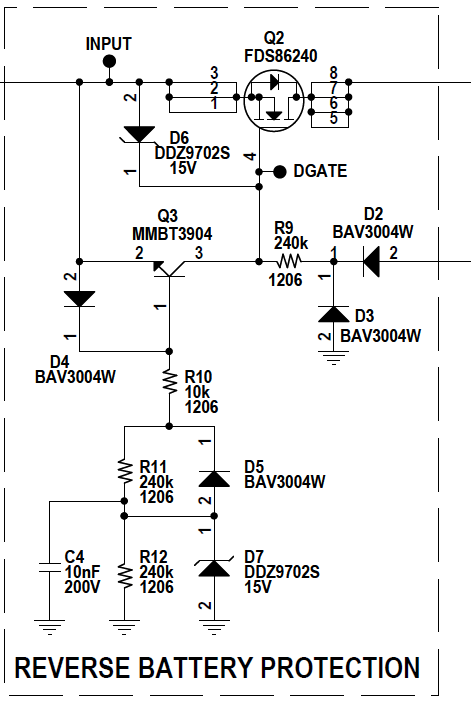 In short, this circuit protects the downstream components by shorting the negative voltage when present at INPUt to DGATE and thus turning off Q2. when the voltage at INPUT is positive, Dgate gets biased via D2. The DC2062A features reverse protection circuitry that protects downstream components from reverse transients of up to –150V. This number is limited by the BVDSS of Q2. 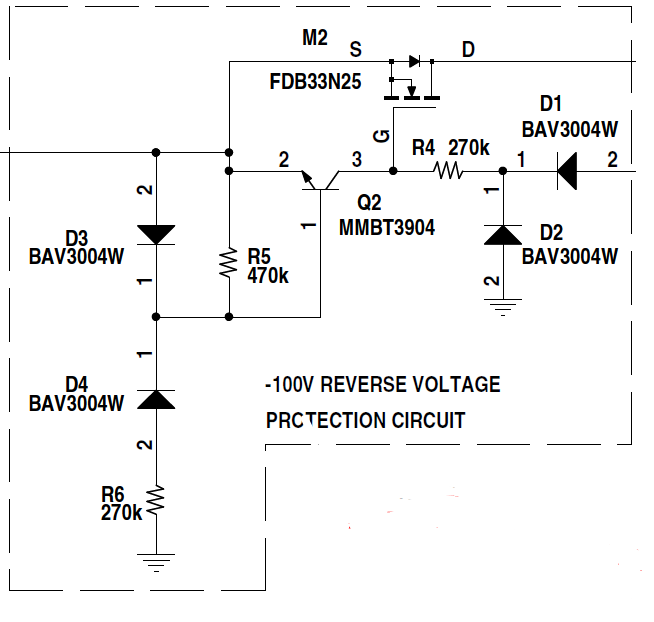 The reverse protection circuitry also protects against reverse DC voltage of up to –30V. Why is the reverse DC voltage protection limited to only -30V? I simulated the circuit at input -100V and couldn't find what components are stressed or damaged at this voltage. So where did the number (-30V) come from? Am I missing something here? I want to know this as I would like to make the circuit block negative voltages upto -100V. What are the pros/cons of using zener diode and capacitor in the first circuit over using the simpler solution of the second circuit? I'm guessing that the capacitor is used as a tank help turn off the mosfet Q2 quicker when the input voltage is suddenly switched from a posotive voltage to a negative one. I'm not sure. the -100V is a 5A inductive pulse, whereas DC survival spec is only -30V +50V. The 2nd simple circuit is missing parts and will not survive all the test conditions for ISO-16750-2 tests 1 thru 5b . Keep this date in mind when reviewing solution documents. For more details, consult with ISO-16750-2 or the older (2010) ISO7637-2 test levels on each pulse and Steady state conditions. THere are different classes III and IV with pulse levels up to -600V for 24V system. Not the answer you're looking for? Browse other questions tagged mosfet protection zener polarity reverse or ask your own question. Does an over voltage, over current and reverse polarity protection IC exist? Do DC/DC converters provide reverse polarity protection?